If you’re reading this, the chances are I don’t need to tell you. 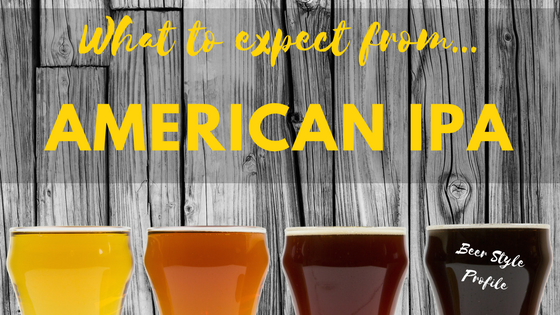 American IPAs are perhaps the defining style of modern craft beer. New ones appear all the time, most of which shine briefly and disappear just as fast only to be replaced by another. These are brewed to be drunk fresh while the pronounced hop characters are at their most evident. Built on a pale ale malt base, often with yeasts that add plenty of fruity esters, it’s all about showcasing the American hops such as Cascade, Chinook, Citra or Mosaic. These beers are bigger and more in your face than a classic English IPA. The aroma is big on hops, often with a tropical fruit-salad getting up in your grill. Other notes to look for are citrusy, floral, perfume-like, resinous, and piney. Many versions are also grassy from dry hopping, although this is not required. The colour ranges from medium gold to medium reddish copper; some versions can have an orange-ish tint. They can be clear but it’s increasingly common to see at least some haze. Super-hazy, opaque beers that look more like orange juice are in vogue at the moment but who knows how long that will last? They should have a good head of white foam, and look for lacing too. When you taste expect a medium to high hop flavour which should reflect an American hop character with citrusy, floral, resinous, piney or fruity aspects. There will be medium-high to very high hop bitterness, although the malt backbone should support the strong hop character and provide the best balance. The malt flavour should be low to medium, and is generally clean and malty sweet. The bitterness may linger into the aftertaste but should not be harsh. There should be a dry finish.